Wildlife is great to see in nature, but it's a different story when wildlife get close to our homes. Here are some common creatures that might find their way near your home. 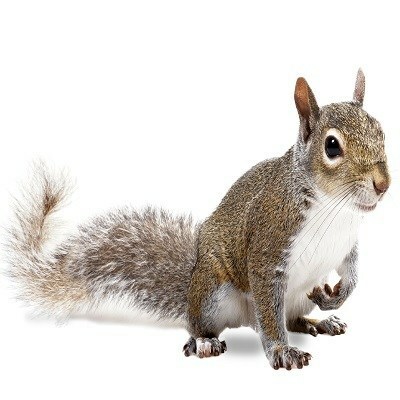 General Info: There are more than 200 species of squirrels. Tree squirrels are most commonly recognized, but there are squirrels that burrow and live in the ground. You will find squirrels everywhere, from forests to community parks. Residential Location: They are active in the mornings and late afternoons. You will usually find them in your yard or on your porch. Random/Interesting Fact: Similar to other rodents, squirrels have four front teeth that never stop growing. Identification: White to gray, yellow, red and brown with pale to dark belly. Many have bushy tails. Our wildlife experts can safely block squirrels from accessing your home. General Info: Opossums are nocturnal mammals. They usually live alone, but have 2-3 litters a year with about seven in each litter. These mammals frequently bring ticks and fleas to an otherwise clean residence. 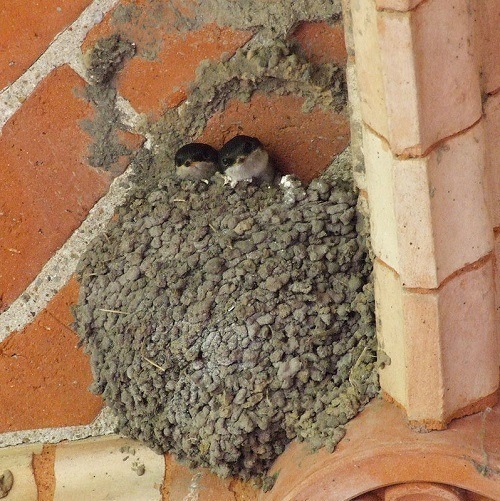 They often destroy insulation as they create nests. Residential Location: They prefer to live near streams or swamps, woods and open fields. They usually take shelter in cavities of trees and brush piles. Opossums often enter crawlspaces to tear apart insulation into a warm nest. They can also be found in attics and unlocked sheds. Random/Interesting Fact: Opossums, which are found in North America, and regularly confused with possums, which are found in Austraila, New Zealand, and the surrounding areas. Identification: Opossums have long pointed faces with round hairless ears and rat-like tails. They are fairly docile. 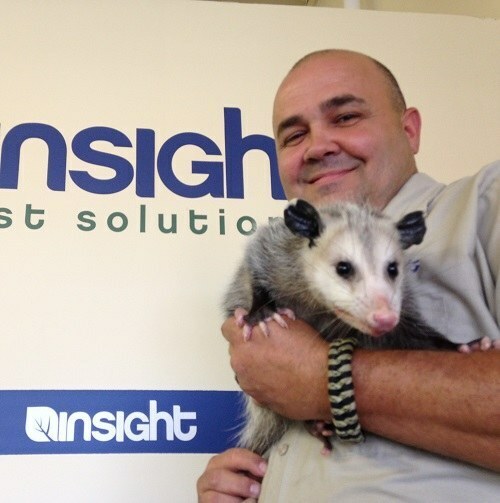 Licensed wildlife professionals from Insight Pest Solutions trap and transport wild opossums to designated relocation areas. General Info: Snales are one of the most hated and feared group of pests in the world. Snakes are carnivorous reptiles that prowl for rodents, insects, and other small animals. Some snakes have dangerous venom that is injected as they bite. Although snakes are very cautious around humans, they will approach homes in search of food. Residential Location: Usually found up against the foundation of a home, slithering through flower beds and bushes. Random/Interesting Fact: Snakes do not have eye lids. Identification: Snakes are found with many different scale patterns, colors, and sizes. It is best to be familiar with the common snakes found in your area. If bitten, be sure to get a good description of the snake to help the doctor prescribe the correct antivenom. 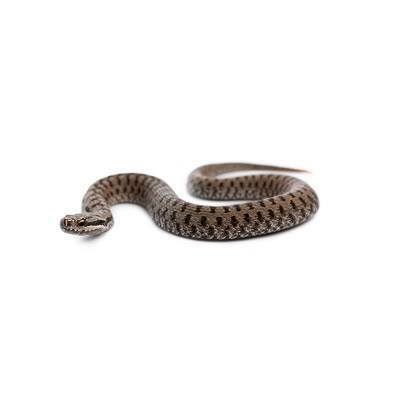 Our wildlife team can capture snakes on your property and/or apply snake-deterring products to keep you safe. General Info: Raccoons are nocturnal creatures known for their “bandit masks” that cover the area on the face around the eyes. They are omnivores that eat plants, animals, mice, fish, nuts, etc. They usually have 1 litter of babies a year. 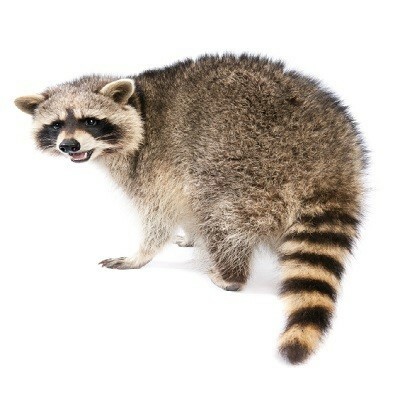 Do not approach a raccoon. Not only do they have claws and sharp teeth, but they often carry diseases and other pathogens. Residential Location: Found around trash cans and recycle bins. They can also be found in sheds and sometimes attics. Random/Interesting Fact: Raccoon populations in urban areas can be upwards of 20 times the population of raccoons in the surrounding rural areas. Identification: They are stocky with heavy fur and dark rings around the tail. 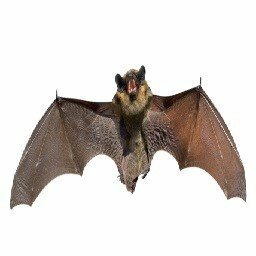 General Info: Around 2/3 of bats feed on insects and around 1/3 of bats feed on fruit and nectar. There are 3 species of bats that drink blood (vampire bats), but these are only found in Latin America. Random/Interesting Fact: Bats make up between 1/5 – 1/4 of the world’s mammal species. Identification: They can be tan, black, or brown. Insight Pest Solutions does not offer control of birds. We can only provide suggestions for bird deterrence, if desired. General Info: These warm blooded animals have feathered wings and body with scales on their lower legs and feet. The shape and sizes of a bird’s beak correlates with the types of food it eats. Nests are mostly found off the ground, but there are some who live in burrows underground. Although birds often eat insects, they are often considered a pest since they build nests on homes, carry diseases, and create a mess of droppings. Residential Location: Usually there is evidence of a nest built around the tops of porches, near gutters, porch lights and fire places around the home. Random/Interesting Fact: Birds have hollow bones that help them fly.